Shortly before Christmas six years ago, a Birmingham family embarked on a new journey when they welcomed 12-year-old Heather into their home. “She arrived with a black trash bag that contained all her belongings,” Susan Nolin recalled of the day she met the young emergency foster placement who would become her adopted daughter. Nolin, her husband Denver, and their birth daughters, Kathleen and Sara, had just trained and qualified to foster or adopt when the troubled young girl entered their lives. Much has changed since that Christmas, and Heather, who the family adopted in 2009, is now a happy college freshman. Their story will be one of four spotlighted on CBS television’s upcoming “A Home for the Holidays” special about children from foster care and the inspiring families that adopted them. The program will air nationally on Friday, Dec. 19, at 8 p.m. Central Standard Time. The program includes footage that was shot in the family’s home and at Samford University, where Susan Nolin works. Kathleen is a recent Samford graduate, and Sara and Heather are students at the school. The show will feature performances by Jennifer Hudson, Train, Earth Wind & Fire, Rixton, Katharine McPhee, Ashley Monroe, Dan & Shay and Jillian Michaels. The decision to share their story came easily. “Our family is passionate for the care of the foster kids in our city, state and nation,” Nolin said, citing the 400,000 children in foster care in the United States, including about 6,000 in Alabama. “For reasons out of their control, some of these kids will never go back to live with their birth families. They are waiting for a home and a family to love and take care of them,” she said. This year’s CBS special, the 16th annual, will focus on the need for families to adopt older children, as the Nolins did with Heather. After aging out, fewer than four percent go to college and more than 50 percent are unemployed. Forty percent of persons in homeless shelters are former foster children, she said. The Nolin family had felt a call to foster or adopt before meeting Heather. “We believe that we are all adopted into God’s family, and that He has called us to care for the orphans in the world,” Nolin said. Even so, their happy, content family was taken by surprise when they felt the call to adopt. “The girls were teenagers and we were within a few years of being empty nesters,” recalled Nolin, a senior systems analyst in Samford’s technology services department. Their step into the media spotlight began last year when they appeared in a National Adoption Month video for Heart Gallery Alabama to promote the adoption of children in Alabama’s foster program. Heart Gallery then submitted the family’s story to CBS to consider for the holiday special. This fall, a CBS crew arrived from California to film the family at home in Birmingham. 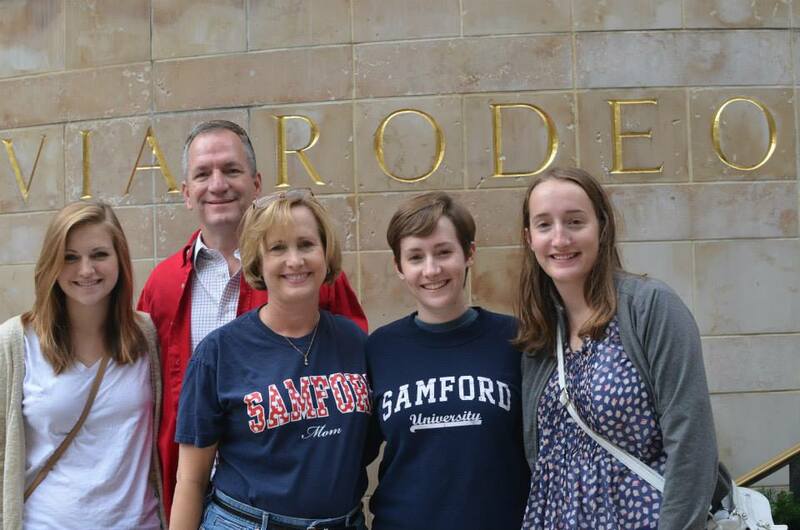 The Nolins enjoyed introducing the visitors to Samford. “They all said it was one of the most beautiful and friendly campuses they had ever been to,” said Nolin, adding that viewers will notice one shot with the girls walking down the library steps, a trek that is familiar to all three. Kathleen, the eldest, graduated on Dec. 13 with a double major in human development/family studies and French. Sara is a junior psychology major, and Heather is a freshman early childhood/elementary education major. In early December, the family flew to Los Angeles to tape the show that will air nationally. They spent a few days sightseeing, and on taping day at the CBS studio they had their own VIP dressing room alongside the Hollywood stars. During the taping, they viewed the finished Birmingham video for the first time. “It was a flood of emotions as they took us through our story in about four minutes,” said Nolin, adding that the stories of the three other families were also “heartwarming and heartbreaking” at the same time. A backstage highlight came when they met entertainer Jennifer Hudson. “Her performance of ‘Hallelujah’ brought me to tears,” Nolin said. Adoption isn’t just about the parents, but is about the family, she stresses. “Heather had to adopt us as a family just as much as we adopted her as our daughter and sister. It takes support from extended family and community for this to happen,” Nolin said. Daughter Sara echoes the sentiment. And Heather, whose life has been forever changed since arriving on her new family’s doorstep, hopes the program will help other foster children find permanent homes.